The blurb for SSEMF’s performance on Wednesday proposed a tour of 18th-century Germany, France and Italy, a journey satisfactorily accomplished with compositions from composers who lived in those countries as well as England. And like many musical programs it was also a journey through time. The first piece, a suite by Michel de la Barre, while published in 1710, nevertheless in style looked back to the early years of Louis XIV’s court. Played by Jeffrey Cohan on baroque flute and John Lenti on baroque guitar, the music was graceful and elegant, the allemandes eminently danceable and the two character studies lively and varied. Lenti changed to theorbo for Pierre Philidor’s Neuvieme Suitte of 1717 and the difference in volume was appreciable. From the very delicate sound of the de la Barre to the deeper tones of this later piece, both instruments were well balanced with each other. The theorbo supported and sustained Cohan’s flute through an expressive Lentement and an oddly languishing Courante. They played well together in a lively Rigaudon, but the fine balance was especially noticeable in the Fugue as the two lines wove around each other. The solo baroque guitar travelled though time in the next piece, a Passacaglia by Francesco Corbetta, or rather two Passacaglias run together. Corbetta, himself was much travelled as an Italian who moved from the court of the Duke of Mantua and to Hanover and then to France to Louis XIV’s radiant court and later to England with the restored Charles II. Teacher and composer, he was renowned as a guitar virtuoso. The first part of the Passacaglia was an early composition which showed off his technique. Lenti added Corbetta’s variations on the same ground, composed much later, which were ravishing. The last piece of the first part of the program was a Sonata for flute by Pietro Locatelli, an Italian working in London. Fully fledged 18th century format, Adagio, Allegro, Largo, Allegro, held the stage. The second half was devoted to sonatas by arguably the two most famous 18th century composers, Handel and Bach. Set side by side, the fluid, vivid music of Handel complementing and complemented by Bach’s rich, introvert poetry, the sonatas illuminated the wide emotional range offered by the Baroque period. 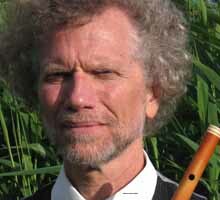 Jeffrey Cohan played on a modern copy by Von Huene of an original Denner flute.